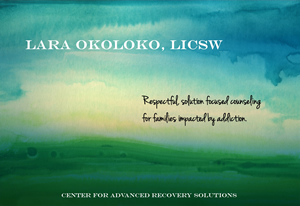 Lara Okoloko, LICSW provides respectful, solution-focused counseling to the family members of addicted people, using harm-reduction and evidence-based counseling methods. She is one of the few CRAFT certified clinicians on the West Coast and offers families an alternative to confrontational or detachment approaches. She provides individual and family counseling as well as quarterly Saturday workshops for the friends and families of people with addictions.